Todd L. Padnos is a partner in the Business Trial and Finance & Bankruptcy Practice Groups in the firm's San Francisco office. For over twenty-five years, Mr. Padnos has represented clients in regulatory, litigation and restructuring matters throughout the country. Mr. Padnos devotes much of his practice toward the representation of insurance companies operating in markets across the United States. 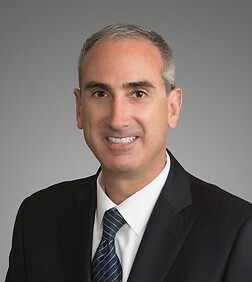 He counsels insurers on a broad range of compliance matters, including rate regulation, pricing, product formation, underwriting, claims handling, operations, premium tax, reinsurance, corporate governance, licensing, market conduct and financial examinations, consumer complaints and deceptive practice claims, and internal and regulatory investigations, as well as legislative and rulemaking matters. In addition, Mr. Padnos regularly represents insurers before state insurance departments, administrative tribunals and state and federal courts across the country on a wide variety of matters, including ratemaking, compliance, and restructurings. Mr. Padnos devotes the balance of his practice toward the representation of distressed companies, creditors and asset purchasers in workouts, restructurings and bankruptcy cases. Prior to joining Sheppard Mullin, Mr. Padnos was a partner of Dewey & LeBoeuf LLP and Orrick, Herrington & Sutcliffe LLP. Allstate Insurance Company, in the industry's first effort to utilize the Fama-French derivation of the capital asset pricing model to calculate its cost of capital when developing its rates. Allstate Insurance Company, in the industry’s first challenge to the application of California’s new prior approval ratemaking regulations. Allstate Insurance Company, in the industry’s first effort to have a Florida private passenger insurance automobile rate application adjudicated by an arbitration panel. Liberty Mutual Insurance Company, in the insurance insolvency of Golden Eagle Insurance Company. KB Insurance Company regarding enterprise risk management reporting. Automobile Club of Southern California regarding auto insurance compliance matters. Infinity Insurance Company regarding auto insurance compliance matters. Wawanesa General Insurance Company regarding auto insurance compliance matters. Fidelity National Financial, Inc., in real property title insurance ratemaking and ratemaking-related matters in jurisdictions across the country, including California, Colorado, District of Columbia, Florida, Indiana, Louisiana, Maryland, Michigan, Nebraska, Nevada, New Mexico, New York, Puerto Rico, South Carolina, Texas, Utah and Washington. Fidelity National Financial, Inc., in the nation’s first personal property title insurance rate hearing. Fidelity National Financial, Inc., in regulatory investigations and subsequent enforcement actions brought by regulators in jurisdictions across the country, including California, Florida, Indiana, New York, New Mexico and Utah, as well as the General Accountability Office at the direction of the United States House of Representatives Committee on Financial Services. Fidelity National Financial, Inc., in challenges to regulations proposed by departments of insurance across the country, including California, Florida, New York, New Mexico and Texas. Zurich American Insurance Company, in California’s regulatory enforcement test case seeking to invalidate all large deductible workers’ compensation collateral agreements. Accident Fund Insurance Company of America, in defense of a reverse false claims action alleging that insurers failed to comply with their reimbursement obligations under the Medicare Secondary Payer Act. United Wisconsin Insurance Company, in license expansion and reinsurance matters. YRC, Inc., with respect to self-insured workers’ compensation insurance collateral determinations in jurisdictions throughout the country. CompWest Insurance Company, in various claims handling and employee-classification disputes. California State Compensation Insurance Fund in various compliance matters. Co-authored the mitigation plan used to convince the U.S. Justice Department not to indict a major insurance company. Represented various insurers in internal investigations and negotiation of non-prosecution agreements with regulators. Arnold Rissman, defense of a $100+ million securities fraud and duress lawsuit related to the sale of Tiger Electronics to Hasbro, Inc., which victory was affirmed by the Seventh Circuit Court of Appeals. In re Fretter, Inc., prosecution of a multimillion-dollar fraud lawsuit against the liquidating consumer electronics retail chain and certain of its officers and directors. Chairman of major financial services holding company, prosecution of a multimillion-dollar fraud lawsuit against a hedge fund. Dish Network, in a dispute with a supplier of componentry used in the manufacture of its satellite television transceivers. Shareholders of a state-chartered bank, in a post-sale lawsuit brought by the purchaser for breach of representations and warranties. Ambac Financial Group, Inc. & Ambac Assurance Corporation, in the former’s chapter 11 restructuring and the latter in its restructuring and the creation, administration and rehabilitation of a segregated account of certain assets and liabilities, in what was described by U.S. News & World Report as "the biggest bankruptcy of the year." HA-LO Industries, Inc., the country’s leading promotional products distributor, in its chapter 11 restructuring. Murray Energy Corporation, the country’s largest privately held coal mining company, in its out-of-court restructuring. Leading life insurance company, in its out-of-court restructuring. LandAmerica Financial Group, Inc., representing Fidelity National Financial, Inc. in its contested acquisition of Commonwealth Land Title Insurance Company and Lawyers Title Insurance Corporation, which required approval of the Bankruptcy Court administering the parent holding company, the Nebraska state court administering the rehabilitation cases of the target companies, three state insurance commissioners and the Federal Trade Commission. Aviza Technology, Inc., representing Applied Materials in its acquisition of the debtor's patent portfolio. Fleetwood Enterprises, Inc., representing Deutsche Bank Trust Company Americas in its capacity as the indenture trustee to the holders of the senior secured securities in the chapter 11 restructuring and subsequent liquidation of one of the country’s largest manufacturers of recreational vehicles and pre-fabricated housing. KineMed, Inc., representing MidCap Financial Trust in its capacity as the senior secured lender in the chapter 11 restructuring of this biotechnology company. Biosolids processing facility, representing Deutsche Bank National Trust Company in its capacity as the indenture trustee in the out-of-court restructuring of this entity. Foxwoods Resort Casino, representing Deutsche Bank Trust Company Americas in the out-of-court restructuring of the Mashantucket Western Pequot Tribal Nation-owned casino. AbitibiBowater Inc., representing Bank of New York Mellon as collateral agent in the chapter 11 case of this pulp and paper manufacturer. Global Container Lines, Ltd., representing Triton Container International Ltd. in the chapter 11 restructuring of this multi-modal international shipping company. ProtoStar I, Ltd., representing Echostar Corp. in its pursuit of the debtor's satellite assets. Conso International Corp., representing GATX Corp., Lincoln National Life Insurance Company and SunTrust Equity Funding in the out-of-court restructuring of this leading textile manufacturer. Tranz Rail, representing a consortium of secured lenders in the restructuring of the New Zealand National Railroad. Dillingham Construction Corp., representing a consortium of secured lenders in the restructuring of this international construction firm. West Contra Costa Healthcare District, representing Principal Financial Group, Inc. in the chapter 9 restructuring of this public hospital. Intellisys Group, Inc., representing Fleet Business Credit as the senior secured lender in the chapter 11 bankruptcy sale of this leading audio-video systems integration company. Midpac Lumber Company, Ltd., representing CIT Group/Business Credit, Inc. in defense of lender liability claims. Pacesetter Industries, Inc., representing Fleet Business Credit as the senior secured lender in the chapter 11 restructuring of one of the country’s largest manufacturers of modular commercial buildings. Kids Creek Partners L.P., representing Leighton Holdings, Inc. in the defense of lender liability and equitable subordination claims. Purchaser of portfolios of distressed assets from the Resolution Trust Corporation in the monetizing portfolio assets. San Francisco Chamber of Commerce, Google, Inc., H5 and Levi Strauss & Co. in the submission of an amicus curiae brief to the California Supreme Court seeking to uphold the marriages of same-gender couples performed prior to the effective date of California Proposition 8's ban on same-gender marriage. Representation of Swords to Plowshares in a matter threatening the operation of one of its largest supported housing programs. Representation of military veterans in pursuit of benefits from the Department of Veterans Affairs.